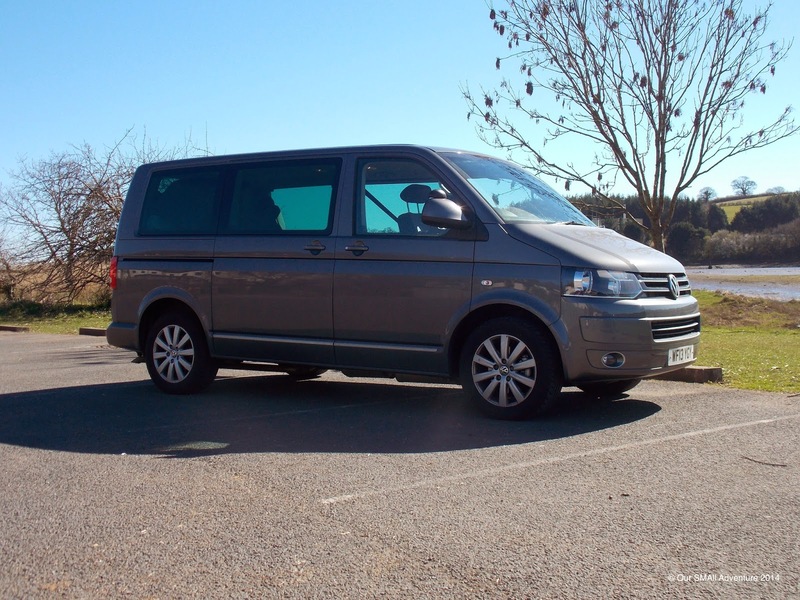 So some of you may have seen my previous blog about the basics of driving from a wheelchair, but it's about time that we introduced the main man in our SMAll adventure, our trusty steed, our beloved Volkswagen Caravelle Nevada: Christian Grey. So there he is in all his glory, isn't be a big beautiful beast? I can't believe that I get to drive such a huge van and although it was a challenge at first, he's an absolute pleasure! And no, I don't always park quite so atrociously. There's also a funny outtake of this video right here! The shell of Volkswagen was adapted for me on the Motability scheme by GM Coachworks UK, which, funnily enough is only 15 minutes from home. This is really unusual as the specialised garages are all over the UK, so I'm lucky that I don't have to travel very far to mine! Furthermore, my parents have a Volkswagen Caravelle T4 that was adapted by the same company in its infancy about 20 years ago (they still have her, called Clarabelle, and she's still chugging along!). It feels nice to keep in touch with GM Coachwork UK and their CEO recognised me 15+ years later when I visited to test drive my own van! I'm so pleased that GM Coachwork UK offered to sponsor us on Our SMAll Adventure, giving us the support we need and specialised mechanical advice along the way should we need it. So the adaptions that GM Coachwork UK did were mainly the access to the vehicle rather than the drive system. They lowered the flooring within the vehicle making it totally level, then installed the tailgate ramp, suspension lowering system and Unwin floor tracking which can be seen in the video above, this is for locking other chairs into the van as my vehicle uses a Dahl locking system which is bolted to my wheelchair, but this piece was fitted by Adaptacar. They also installed two stow-away chairs in the back of the vehicle which you'll see in the video below - these are fantastic as I haven't been able to take friends or family with me in previous vehicles due to lack of space. I have one extra chair that can fit behind the front passenger seat, but I won't be using this in Europe. The reason I didn't have a side lift is purely because I don't like them, my parents had a side lift in a Caravelle for me and I was younger so I'm experienced in both. I find with lifts that when they break, they can break in a big way rendering the vehicle inaccessible or sometimes even undriveable (it brings back memories of the South of France holiday where the lift broke and my Dad had to drive the van with the side door open and lift sticking out until he found a garage!). Moreover, I can't operate a lift on my own and also if a hydraulic ramp such as mine were to break and I was out on my own, I could still nudge it with my wheelchair to get out of the vehicle, whereas I'd be stuck if I had a lift. It also means I can unload easier in parking spaces if I have a tailgate ramp, so many disabled spots don't give enough space at the side for the ramp let alone loading space- my dad used to have to drive half way in, put the hazard lights on, unload me into the road, then park the van fully into the space. In all, the tailgate ramp works well for me! Adaptacar were the company to fit my hand controls into the vehicle, which enable me to drive. I did mention these as they were in my previous vehicle that I posted about, but just to go over it again, I use a Space Drive hand control system, made up of a right steering joystick and a left brake/accelerator. Many people have asked me in the past why I have to push forward to brake, and that's because our initial reaction in a stressful situation is to tense and push our hands forward to brace ourselves, can you imagine the danger if you pushed the accelerator forward in an accident!? I explain more in the video about the individual controls, but you can see its relatively straight forward. I didn't want to show you all the pedals in the video because I was in the way and couldn't reach, but it's basically a piston lever, so the joystick I push operates a lever which presses onto the pedals - it isn't voodoo magic. I'd be so happy to hear from anyone who has any questions about driving from a wheelchair. I'd massively encourage all of you to give it a go, it's an incredible accomplishment and don't forget, Motability allows you to apply from 16 in the UK, that's a whole year early! They have so many wonderful pieces of equipment, and so varied, some even drive with cameras if they can't turn their heads enough, and I have heard through the grapevine that one person learnt to drive lying down! The world CAN be your oyster, but don't forget if you're frightened; so are all other learner drivers, disabled or not! I chose to wear an extra harness that looks like a backpack/3 point harness when I drive to give me that little extra bit of stability that a seatbelt can't offer; it's more of neurotic thing than a physical need but if it makes me more comfortable and confident then I don't see it as a problem. I slip these off when I arrive at the destination, and we're good to go! I have a rare form of MD and was told 6 years ago by an Optician I would never be allowed to drive as my muscles in my eyes are affected meaning my eyes are pretty much fixed forward. Plus I have limited neck movement due to spinal fusion surgery. When I read in this post about cameras being used to compensate it was a break through in my mind. I'd never been told or heard of that before! I have so many questions for you. Please could you email me at markfiabbie.mcguffie@gmail.com to discuss and thank you for this informative blog! Hi Fiona, great to hear from you and that you're finding our blog so useful! Yes, cameras can definitely be used for driving through the Motability scheme that I mentioned. I too, have had a spinal fusion so I have limited neck movement and head rotation- feel free to contact me directly on tori.elliott@gmail.com with questions, however I'm off for the big trip in a few days, so my response may be delayed!